From girlhood, I have loved crafting. So, it only makes sense, that when I started schooling my eldest, we incorporated creative art into the mix. 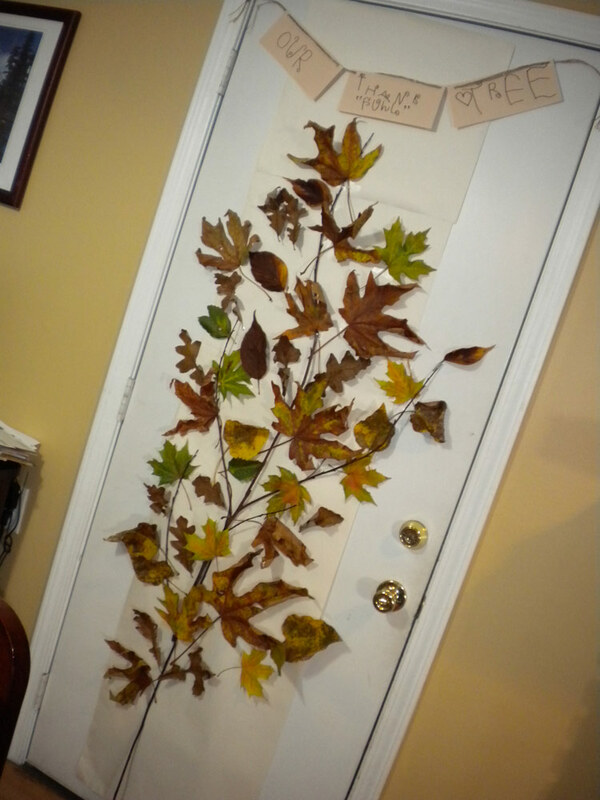 When I saw and heard of a Thankfulness Tree, I knew it was up our alley! What a perfect way to set the mood for the season of harvest and Thanksgiving. I must confess. I saw the original idea on a friend’s Facebook page. The original tree was bought and made from leaf doilies at a local dollar store, which is still a superb idea. Since I am pregnant and my toddler was napping, we wanted to make this now, and didn’t have time for a trek to said store. The light bulb came on. We would use the dried-out leaves we picked up from our nature walk around the neighborhood! We also had a beautiful three-pronged branch my daughter had picked up on the way. Since space is limited in our home, the door from house to garage was the chosen spot. Using masking tape (easily removable and won’t peel paint), we put up a long stretch of paper from the paper roll. Next, we taped the branch to the paper. Then we simply taped on leaves with regular Scotch tape all over the place, making sure we covered up the few areas where the masking tape was visible. I, the perfectionist, caught my daughter placing a leaf off the branches. “But mom, the leaves are supposed to be falling!” She was right. Hence, we let the leaves “fall” where they might. Our “Thank Full” Tree, as we dubbed it, only lacked a proper sign. Using some tan cardstock, my daughter penned “Our Thank ‘Full’ Tree” in her own original fancy writing. Then we punched some holes and threaded my husband’s twine through the top, taping up the twine. You can use tacks, if you’re not worried about holes. Or even putty, so it’s hidden. It’s important to let your kids do most of the work here. They will remember and enjoy it that much more! As you can see, the last step is to write on slips of paper what or who you are thankful for, and place them amongst the leaves. We are not quite done with this last step. My husband and I still have to write our “thankfuls”. My only suggested improvement on this craft is to flatten the leaves completely before putting them up. Also, if you purchase some preserving spray from the craft store, this may keep your leaves in great condition throughout Autumn. Else, they may curl up and crack. Seasonal crafts can be both simple and attractive (not lengthy and tacky). That was the intended goal with this Thank-Full tree. I hope I’ve aiding in adding to your repertoire of family activities! Neat idea! I've seen something similar using felt or paper to cut out the leaves, writing what the person was thankful for right on the leaf. I like this, simple and fun! Combining outside walks and leaf gathering with indoor crafts and pulling it all together with the reasons we have thanksgivings. This can also be incorporated year round as a Blessing Tree! Definitely will be doing this! What a great idea! I think I am going to have to add this to our Thanksgiving decorations this month! Thanks for sharing this! What a fun idea! We're doing a ton of Thanksgiving activities this month but this one isn't on our list. I'll have to remember it for next year.